Emperor scorpions are native to tropical Africa and other countries located near the equator. They live close to the surface in tunnels and under moisture retaining ground litter. 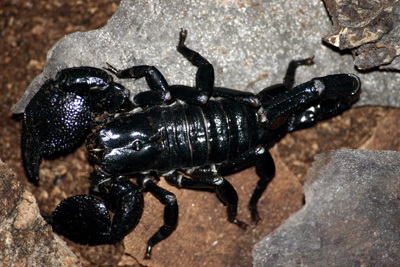 The emperor scorpion can reach a length of more than 8 inches and is one of the largest scorpions. It has a large, shiny black body and bumpy pincers. Its venom is mild and the scorpion as a whole is not very aggressive. This species of scorpion is the most common type found as a pet. Dozens can live together in colonies and this trait makes it possible to have several living together in a communal cage. Although they can live together, it is not necessary. Also note that whenever more than one scorpion lives in a habitat there is a possibility of cannibalism. They make an excellent choice for the novice collector. A ten gallon tank or terrarium is a suitable habitat for emperor scorpions. It will need a heat pad on one side of the tank. The bottom of the tank needs about 3-4 inches of substrate like Eco-earth. The scorpion will also need a shallow water bowl and a hide area such as a half log or cork bark. If there are multiple scorpions, the habitat will require more hiding areas. Crickets and mealworms that have been gut loaded can be the primary diet.